Commercial climbing frames and swing sets are perfect for restaurants, shopping centres, pubs, parks and more! Designed to accommodate heavy usage year-round, they are a fantastic way to keep your youngest, and most demanding, customers happy and content. At Bizzie Bodies, we have a huge range of commercial climbing frames to choose from. No matter how big, or small, your available space there’s a climbing frame for you to choose from. Whether you’re looking for a simple slide and frame combination, or perhaps a commercial climbing frame with swings or a standalone swing set, you’re in the right place. Supplied by Hy-land Professional Playgrounds, our commercial climbing frames can be installed on any surface including grass, sand, or rubber paving tiles. 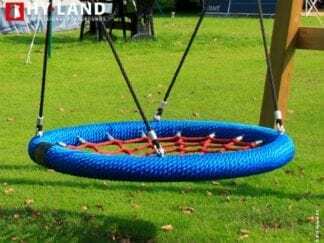 Hy-land was established in 2004 by the makers of Jungle Gym as a solution for commercial play equipment following the popularity of their residential climbing frames. Their range of commercial-grade wooden climbing frames are renowned for their robust, weather-resistant, construction. All Hy-land frames and swing sets are made from sustainable timber which will withstand the heavy use by being placed in public areas. They are heavily safety tested and conform to European safety standard EN 1176 and has been type-tested and GS certified for commercial use for children between the ages of 3 and 12. Hy-land commercial climbing frames are a budget-friendly, robust, low-maintenance option for business owners looking to offer a playground as a service for their family customers. Browse the full range below. Got questions? Call our friendly and knowledgeable team on 01245 562 001 and they will help talk you through your available options.